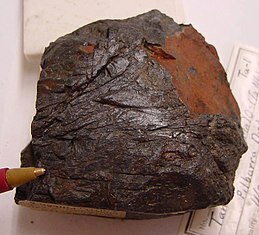 Tantalite is black to brown in both color and streak. Manganese-rich tantalites can be brown and translucent. Tantalite occurs in granitic pegmatites that are rich in rare-earth elements, and in placer deposits derived from such rocks. It has been found in Australia, Brazil, Canada, Colombia (Guainía and Vichada), Egypt, northern Europe, Madagascar, Namibia, Nigeria, Rwanda, The Democratic Republic of Congo, the United States (California, Colorado, Maine, and Virginia), and Zimbabwe. Brazil has the world's largest reserve of tantalite (52.1%). In 2006, 75% of world tantalite production came from Australia. The mining of tantalite causes many environmental and social problems in Democratic Republic of Congo. ^ "TANTALITE (Iron Manganese Tantalum Niobium Oxide)". Galleries.com. Retrieved 2011-10-25. ^ a b Tantalite. Mindat.org (2011-09-07). Retrieved on 2011-10-30. ^ P. Cerny; et al. (1992). "The tantalite-tapiolite gap: natural assemblages versus experimental data" (PDF). Canadian Mineralogist. 30: 587. ^ Melcher, Frank; et. al. (June 2008). "Fingerprinting of conflict minerals: columbite-tantalite ("coltan") ores" (PDF). SGA News (23): 1. Retrieved 10 August 2016. ^ Coltan, Gorillas and cellphones Archived 2005-04-07 at the Wayback Machine. Cellular-news.com (2001-04-03). Retrieved on 2011-10-30. ^ The Coltan Scandal. Geology.about.com (2010-07-04). Retrieved on 2011-10-30. Wikimedia Commons has media related to Tantalite. This page was last edited on 24 February 2019, at 18:11 (UTC).